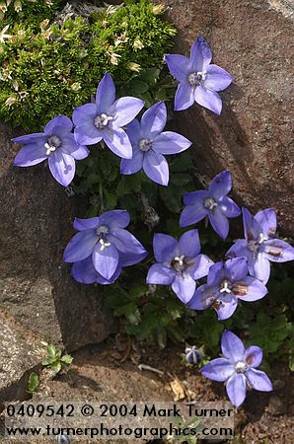 Campanula piperi is dwarf alpine species endemic to the Olympic Mountains in western Washington. C. piperi can be propagated from seeds or divisions. Plant seeds directly in the fall or start stratified seeds inside. If started inside, should be sowed when soil reaches 68ºF. Germination is slow. Do not cover seeds. Increase by division early in spring by root cuttings or by stem cuttings taken with a bit of rootstock at the base of the shoot. Open, quick-draining, but moisture retentive soils of moderate fertility and a neutral Ph will work fine for most mountain plants that can be found in drier mountain slopes. 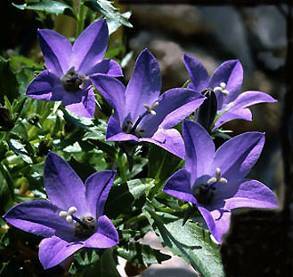 Campanula piperi. BackyardGardener.com. 26 May 2006. <http://www.backyardgardener.com/ plantname/pda_83f4.html>. Dave’s Garden, Plant Files. 26 April 2006. < http://davesgarden.com/pf/go/73191/index.html>. Seed Germination Database. Tom Clothier's Garden Walk and Talk. 26 April 2006. <http://tomclothier.hort.net/page02.html#C>.